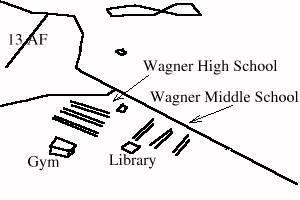 This view looks southeast at Wagner High School (left) and Wagner Middle School (right). 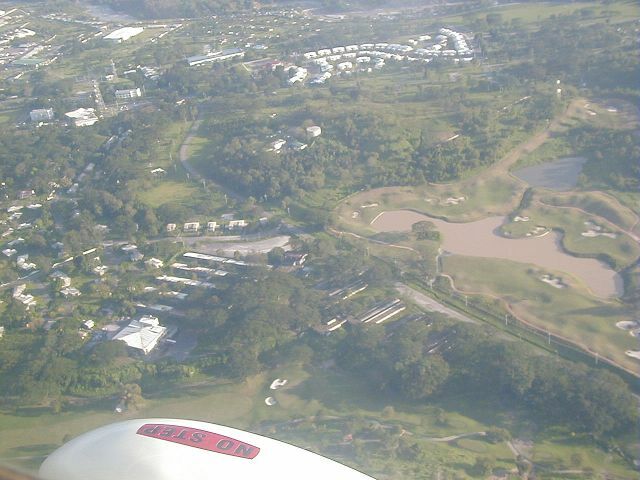 It can be seen that the FM Washout which used to nestle right up to the schools has been developed into a golf course owned by Mimosa Leisure Estates. On the right side of the photo is the True North Golf Course. The hourglass-shaped white houses in the distance are part of the Redwood Villas, which replace the old housing area along Welch St. The 13 AF buildings, now home of the Clark Development Corporation, are at the top left. Want to correct or clarify information about this photo? Send an E-mail to clarkairbase@clarkab.org. Mention you are referring to page "a39.htm".